I just finished reading the “Teach Like a Champion 2.0.” What I love about this book and its first version is that they offer tips and strategies to improve teaching that are based on best practices of actual classroom observations. They offer tips to take you from being a good teacher to a champion teacher and are therefore excellent reads for educators who have been in the classroom a few years. The book is divided into very practical sections that deal with topics all teachers must handle in the classroom. The first section is dedicated to the all important task of checking for student understanding. It’s the art of making sure that every student in your classroom is following your instruction and reaching your learning goals. My favorite tips from this section were planning your questions in advance and standardizing your materials so you can more easily track student learning. Champion teachers write notes in their lesson plans about which students they will ask and what questions they will ask to ensure their lesson is achieving its goal. It’s also important to standardize materials so students always know where to find information and so teachers can scan and analyze student work quickly, checking for errors and collecting data on results. The second part of the book is dedicated to the academic side of teaching. It’s how teachers ensure that their lessons are well-structured and rigorous. Although I knew all about backwards design and differentiation, I had never heard of “double planning” before I read this book. It’s the idea that champion teachers plan their lessons and then go back and plan what students will be doing at each point in the lesson. I understood this concept before knowing the name, but what I especially liked was the suggestion to use packets of material when teaching. There are many good reasons to do this but my favorites are 1) it allows teachers to tailor their lessons to different classes and even individual students and 2) teachers can mark up the packets with important notes and reflections about the learning. Essentially, a packet gives students and the teacher a road map of learning that can be steered in different directions based on students’ needs. The third part of the book gives tips for lesson delivery. It offers important strategies to increase the rigor and effectiveness of every lesson. One of the easiest ways to do this is by allowing students more opportunities to work with their peers. As teachers, we have to give kids the most time to grapple with the content and voice their opinions. Most teachers know activities to accomplish this, but just as important as these are the physical classroom space and how students are arranged during each activity. Just now in my fifth year as a teacher have I started playing around more with the layout of the furniture in the classroom and with students groupings. It makes a huge impact on the effectiveness of different activities, whether they’re suited for pairs, groups, or solo work. And finally, the fourth part of the book is all about classroom culture. The five parts of building a positive classroom culture are discipline, management, control, influence, and engagement. The best tips in this section include creating simple routines for students to accomplish everyday tasks and ways for teachers to get control of students quickly and without interrupting the flow of the lesson. This section is full of great reminders for practicing teachers to reassess their classroom policies and make improvements. I know over the past five years I have tweaked how I manage all five aspects of culture because these are what separates a good teacher from a champion teacher. 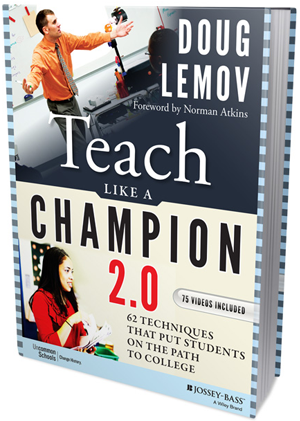 I think that “Teach Like a Champion 2.0” is a great read for all teachers to refresh their skills. I really appreciate that after each chapter full of tips and examples there are questions and exercises to guide educators in evaluating their own practices. This book is a great read for teachers to refresh their pedagogical toolkit and hone their classroom skills.